At the Serge Normant Salon with Eugene Smith. When I moved to New York in the early 2000’s I needed to find a good salon. I knew I couldn’t go wrong when I was referred by a highly reputable stylist in the D.C. area to go to the Ted Gibson Salon, a top, Black-owned salon in Manhattan. As they say, the rest is history. 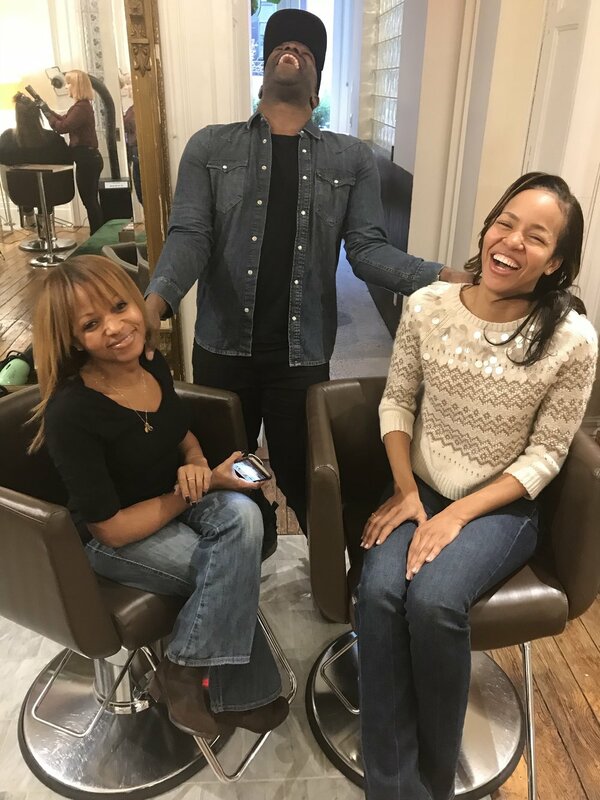 At Ted Gibson, I found, not only a hairstylist from D.C. doing great work in NYC, I also found a friend who I felt totally comfortable with in his chair, where I enjoyed many years of healthy hair. Eugene Smith, is that hairstylist, who now works at the renowned Serge Normant salon in New York (downtown location) and continues to not only be an amazing stylist, but a “hairapist” all in one. Recently, September Set sat down with Eugene to discuss his career and the Black hair industry. We started there but got so much more from this stylist who has styled the likes of Mariah Carey to Naomi Campbell to former U.N. Ambassador to the U.S., Susan Rice. From tips to Black hair stylists wanting to open a shop, to the importance of black women treating themselves well and choosing a salon that honors their hair and their time, Eugene dropped many gems that we are happy to share with our readers. SS: When did you know you would become a hair stylist? Eugene: I was supposed to be a lawyer and was going to college for that but my wonderful, open minded mother asked why I was going to college because I had a talent for hair styling. I didn’t know people would pay me to play in their hair but she enlightened me. So I decided to go to the best beauty school in the DC area. SS: How did you approach hair styling when you started out in the business? Eugene: When I started, I was focused on doing what I loved to do and I wasn’t thinking about the person in my chair until I got my first client who started crying because they loved their hair so much. I realized this was more than just about hair. There is an energy exchange in the process; a connection I could make with my clients. SS: When that experience happened, how did it change you and your trajectory for your career? Eugene: I realized that I was connecting with people and how important this is and when I have a Black woman in my chair, that’s our instant connection. Also, I want everyone to have a good experience so for me service is service and it doesn’t matter what color you are, when you sit in my chair I want you to have a great experience and do good work and make a connection because I want you to come back. SS: Why did you move to NYC? Talk about how you grew your career in predominantly white salons in the DC area and in NYC? Eugene: I wanted to grow my career to the next level so I wanted to work in the best salon and the Ted Gibson salon was that salon when I moved to New York in 2005. I knew I wanted to have celebrity clients and grow and I was able to do that at Ted Gibson. I then realized I was an asset in these settings because, even though Ted Gibson was a Black-owned salon, the majority of the clientele was white, with only four Black clients when I started but the Black clientele just grew. I was bringing in the Black clients. I was also dispelling the stereotypes that Black women don’t spend money and also teaching those I worked with how to properly treat Black women when they come into the salon. SS: How did this look when you have taught your colleagues how to treat Black women and their hair in a broader since across the industry? Eugene: I have had to teach stylists how to approach Black women when they came in to Ted Gibson and now at Serge Normant because it’s just different. And if I get ignorant comments like its time to bring out the grease, etc. I check that person in that moment. But it’s about the client feeling comfortable and leaving having had a great experience. SS: Talk about changing the way we look at Black women’s relationships with salons. Eugene: There are a lot of professional Black women who go to the best hotels, etc. but then go to a salon and wait for 8 hours to get their hair done. They aren’t going because it’s cheaper, they are going because they know their hair will be laid; because the salon does great work. But Black women have to realize they are worthy of their time not being compromised for a great hairstyle. I think Black hair stylists and salon owners can go further by implementing business practices that get their clients in and out without the long wait times. Because Black women are worth it. SS: Well said. Many of us have had that experience but when we have a different experience we demand better. What advice do you give young hairstylists that work with you at Serge Normant and those who are in beauty school now about to enter the industry? Eugene: When I have Black assistants, I lead by example. I teach them to be respectful of every client and work toward finding their place in this business. It’s also about focusing on the process to get to a great hairstyle and not just the result. I see that is lacking now with the millennia’s and I emphasize the importance of the process instead of the end result. It is also important for young Black hair stylists to try everything, which is what I did. I did the celebrities like Mariah who was a dream come true for me. I did campaigns like Rocawear where I worked with Naomi and Beyoncé and it was all-great so I encourage them to diversify. Their potential is limitless! SS: You have had a full career and are clearly not stopping or resting on your laurel’s. What’s your definition of success? Eugene: I am my definition of success. I have reached a point where I can pick and choose my projects and that freedom is awesome for me. I focus on the experience now with my clients. I’m still trying to impress my long-term clients. I am a “hairapist” now too and if clients need advice, I give it. SS: What does your future in hair look like? Eugene: I could easily see myself doing hair until I am 85 because I don’t work. I enjoy everyday. Eugene is living his dream and beyond and we at September Set consider him a model of self-confidence and positivity that we had to share with you, our reader. As we approach a new year, lets reflect on our own crafts and how we can grow and enjoy everyday as Eugene does. A life well lived is about doing what you love and bringing light to those you serve or encounter daily. Let’s go into 2019 on this note!